The Prudential RideLondon is a legacy of the 2012 Olympic Games. It’s an annual festival of cycling developed by the Mayor of London and managed by London & Surrey Cycling Partnership. Kingston upon Thames is a great place to see the action as it’s the only point where the cyclists pass through on both inbound and outbound legs. Kingston celebrates the event with activities in the town centre: big screen, live music, street entertainment and BMX stunt show. There are lots of cafes, restaurant and bars and all the shops will be open for business. 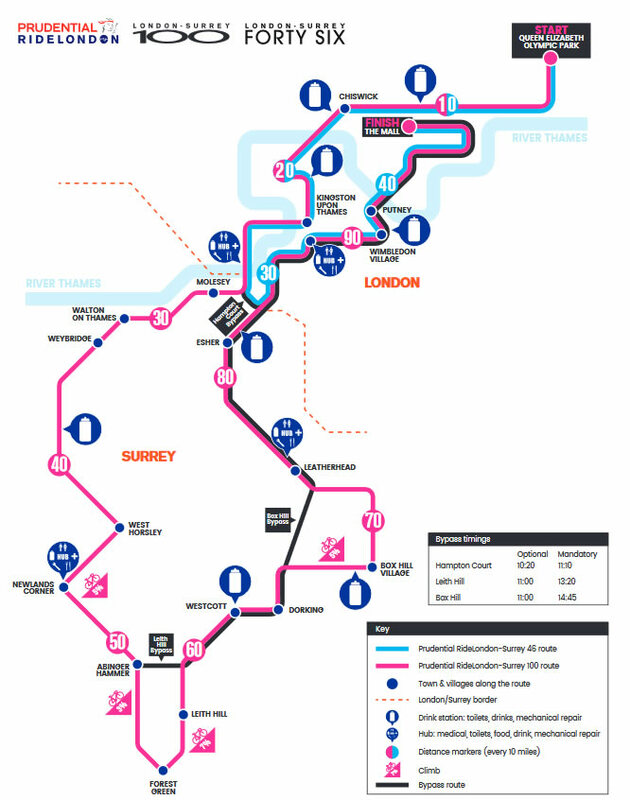 Events on Sunday will run from London through Surrey See routes. Trains, cycling and walking are the best forms of transport to Kingston on the day. Roads will be closed from 05:00 on Sunday 29th July. They plan to reopen by 19:30 though some open earlier. The 2018 Prudential RideLondon Handcycle Grand Prix will start at 19:50 on Saturday 28 July. A number of Paralympians and leading British handcyclists will race around St James’s Park in central London. Saturday 28 July 2018. The famous eight lap circuit around St James’ Park starts on The Mall taking in Buckingham Palace. The race starts with a Le Mans-style dash, before taking on the 16km circuit. The first rider to cross the Finish Line ends the race and takes home a 2018 BWC special edition bike. Women’s one-day professional cycling race. The 2018 race starts at 17:00 on Saturday 28 July. The race takes place on a spectacular 5.5km circuit in central London. Starts in Queen Elizabeth Olympic Park, then follows a 100-mile route on closed roads through the capital and into Surrey’s stunning countryside. Created specifically for newer cyclists and also younger cyclists, who might find a 100-mile challenge intimidating or, in the case of 16-18 year olds, they are not eligible to enter. (It’s not a race!) It’s a spectacular 46-mile route on traffic-free roads, beginning at Queen Elizabeth Olympic Park in east London and following the same route as the Prudential RideLondon-Surrey 100 for the first 27 miles before taking a new two-mile route, which then links up with the last 17 miles through London to the finish in The Mall. A new event for 2018. Starting at Sandown Park in Surrey, the event will take in the final 19 miles of the Prudential RideLondon-Surrey 100 route, going through south west London, over Putney Bridge and into the centre of the capital to the spectacular finish on The Mall in front of Buckingham Palace. It has been created to encourage younger and newer riders to take part in their first mass-participation cycling event and to provide an opportunity for families and friends to ride together. The event is open to riders aged 12 upwards, although those under 16 must be accompanied by an adult. Riders will depart in waves from 14:30-15:30. They will finish on The Mall and will receive a unique medal. 150 of he world’s best cyclists battle it out in Britain’s greatest one-day bike race on a 200km route through London and Surrey. It will follow a similar route as the Prudential RideLondon-Surrey 100 sportive. Town centre activities wind down at 18:00 and all roads should be open by 19:30 – some earlier on outbound routes. A3 open on the day but some slip roads are closed. Richmond park is closed to traffic all day. If you are in Kingston’s Market Place there are lots of pop-up-food places close to the Italian styled market house. Take the passageway next to Joules and you will be in the Apple Market where you ‘ll find The Terrace and other cafes with outside seating. The Bentall Centre and Bentall’s department store also have food areas and if you are after riverside views take one of the passageways near Next, Clas Ohlson or TK Max. Down the main pedestrianised high street you’ll see Marks & Spencers and on the left Fife Road which has fabulous cafes and restaurants.